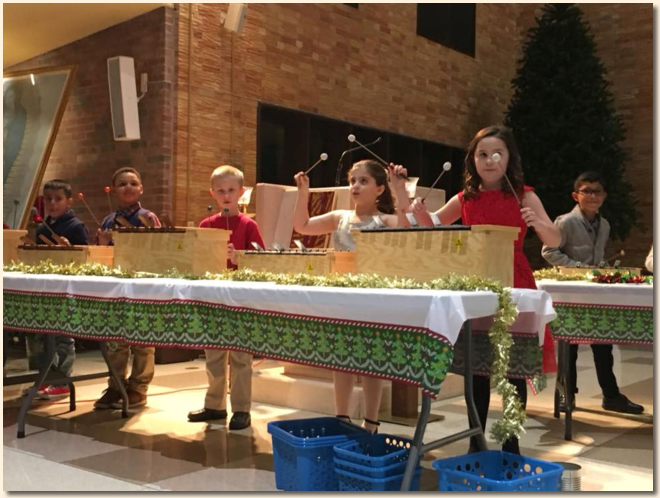 Kindergarten - 2nd Grade celebrated Christmas with a concert in the church. how to play during Music class. It was a beautiful way to start the Christmas season. 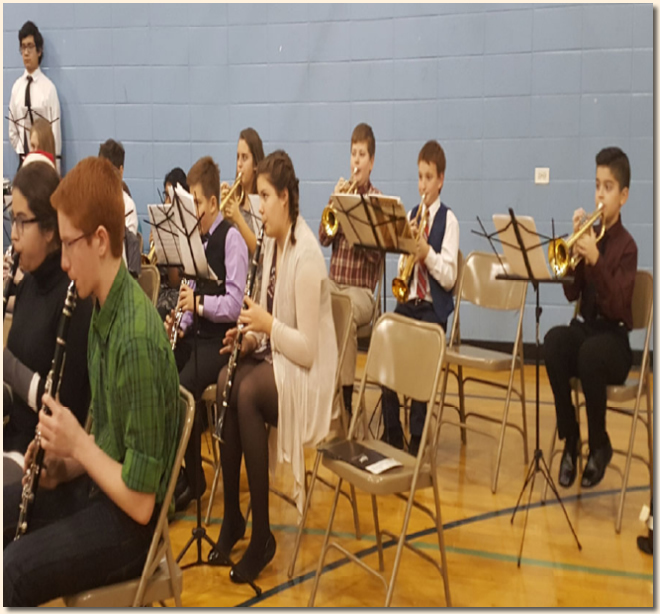 We also had a Christmas Band Concert here at St. Linus this year. The band is 75 strong from 4 parishes with 15 from St. Linus. There is a beginning and advanced band and both were well represented by St. Linus students. 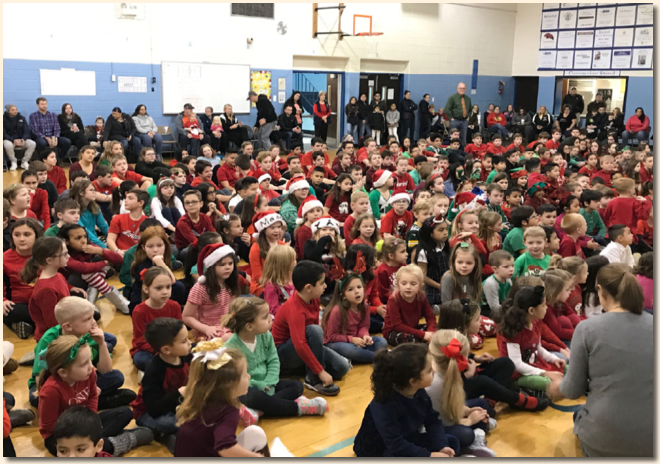 We started our Christmas break with a Christmas Sing-a-Long in the gym. Everyone from PreK-3 to the parents and teachers participated in the sing-a-long. We heard such old standards as Rudolph, Jingle Bell Rock and Jingle Bells. The whole school participated in the traditional 12 Days of Christmas and everyone got into it! 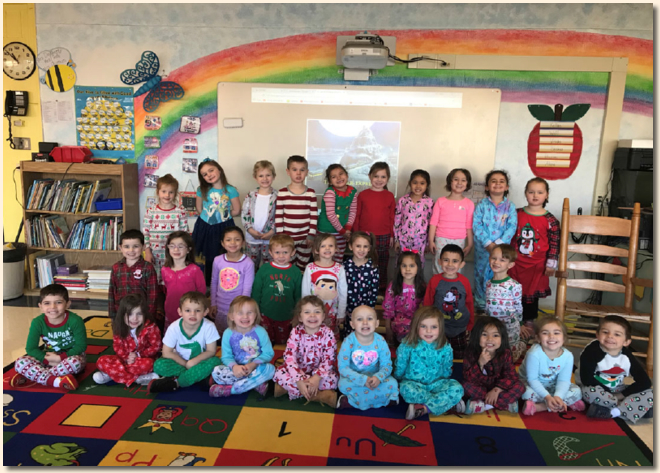 Here is a picture from our Polar Express Day! We made reindeer food and watched Polar Express while drinking hot chocolate and treats. 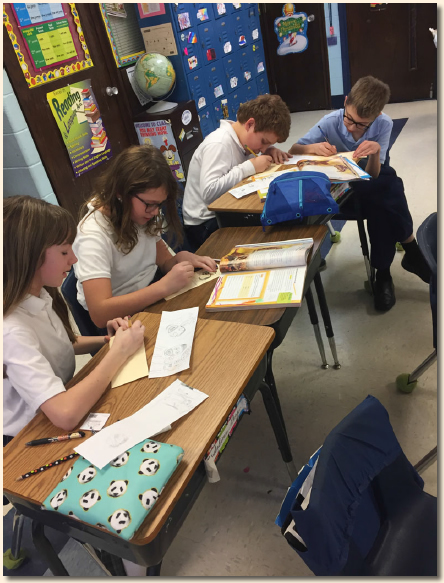 Fourth grade students are learning about the Southeast. 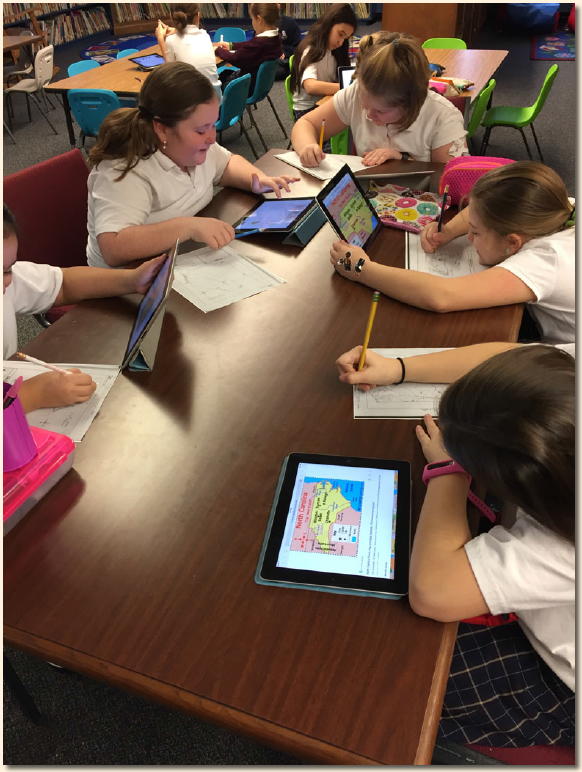 Each student uses an iPad to detail their map locating cities, capitals, and mountain ranges. 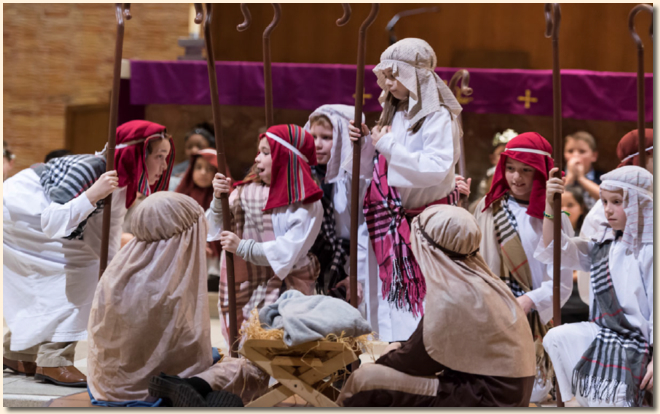 We celebrated our 3rd annual Christmas Nativity Pageant. Our 3rd and 4th graders did another wonderful job teaching us about the miracle of our Lord’s birth. They told the story through words, songs and dance. 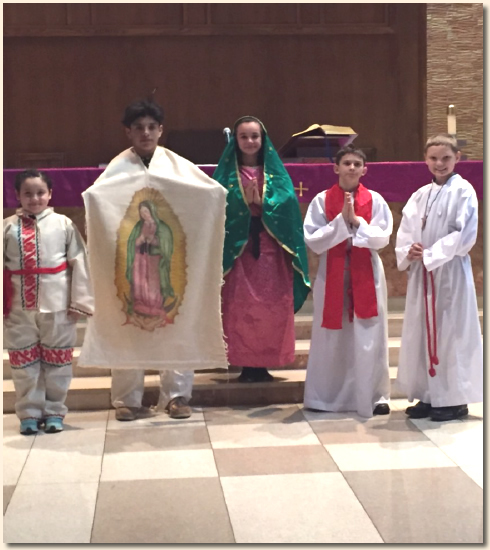 We celebrated the Feast of Our Lady of Guadalupe after 12 Noon Mass on December 10. The students did a beautiful reenactment of her visit to Juan Diego. Maddie Marin, Joe Poloko, Hannah Marin, Ryan Talty and Daniel O’Grady did a great job. Conversion of Saul to St. Paul. 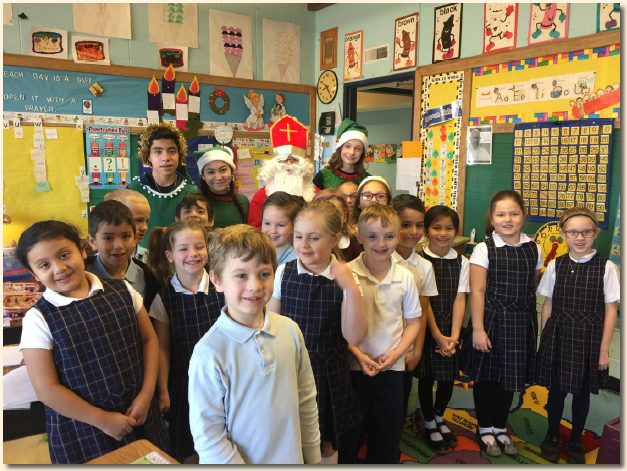 Guess who came to visit the students and brought them each a Treat? Yep you are right St. Nicholas. 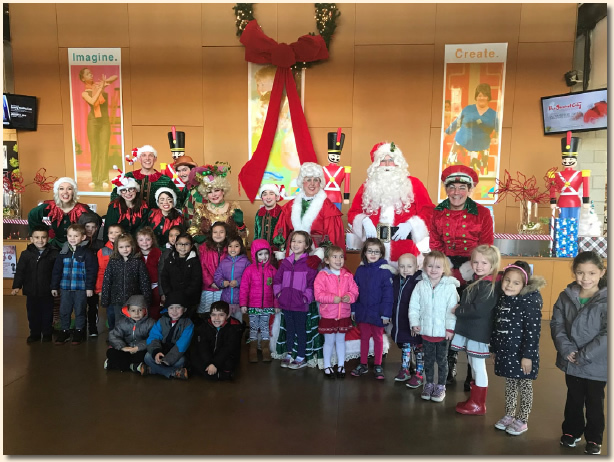 Here is Mrs. Lehnerer’s class enjoying their visit! at the Beverly Art Center. It was a great way to begin the Christmas Season. 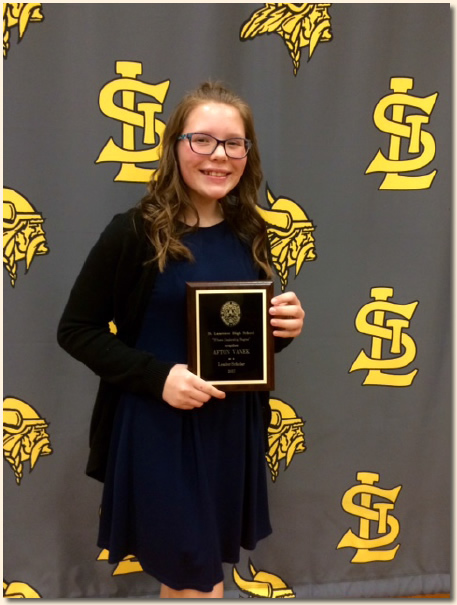 Eighth grader Afton Vanek won the prestigious St. Laurence Leader Scholar Award. The award is because of Afton’s grades, character and leadership ability. 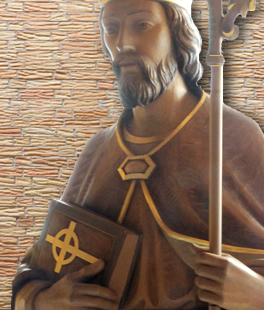 It has a monetary value of $1250 per year at St. Laurence. Congratulations Afton! 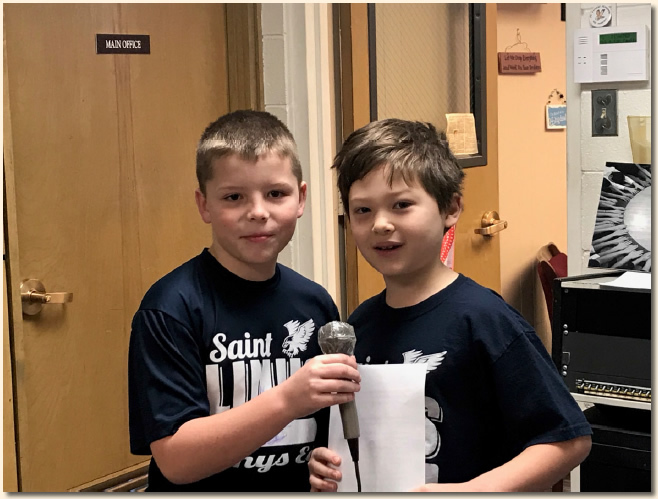 Each day two students do the morning announcements. This includes the Mission Statement, Prayer, Pledge and birthdays. Tommy O’Brien and Aiden Ostrowski doing a beautiful job.